It began as an idea, as many things do for Writer’s Workshop students. In an effort to bring the poetry, fiction and creative nonfiction majors together, senior poetry student and managing editor Kate Bard decided that UNO needed a literary magazine. And that common ground all students share, that regularity, is something that should be celebrated, according to Bard. 13th Floor Magazine, the younger sibling to the Writer’s Workshop student organization, The Crop, gained momentum within the college and after a few weeks of its initial creation, an editing staff was established. Jared Newman acts as Lead Manuscript Editor, Ali Hodge as Promotions Editor, Jessie Liberatore as Design and Layout Manager, KristinPothast as Creative Editor, and Chelsey Risney is their Photographer. To open up the doors of communication between colleges on campus by telling unique stores has become 13th Floor Magazine’s goal. 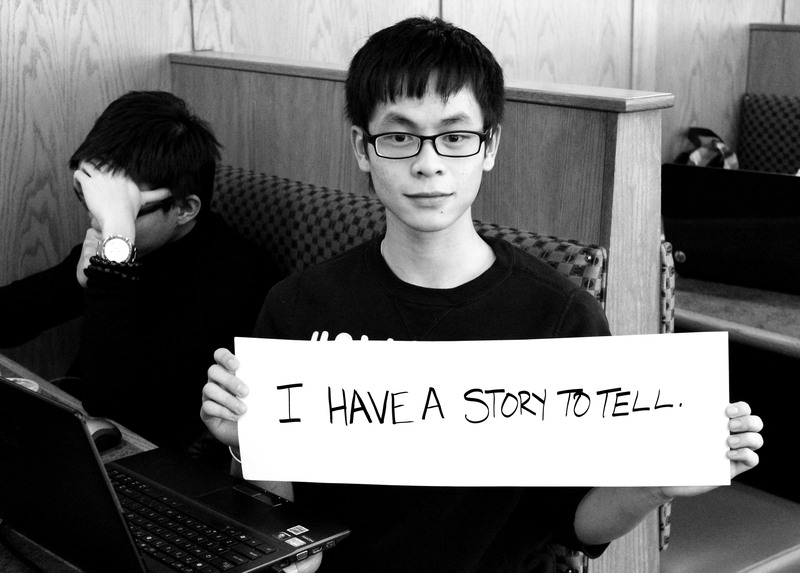 A recent ad campaign by the magazine featured portraits of students from around UNO holding signs that read “I have a story to tell.” The goal of the ad campaign was to include students from all walks and to encourage everyone to look for the specific story they have to tell. Bard said the editing staff is preparing for the very first issue of the magazine. She said the editors decided that the magazine would be more accessible to UNO students if it was published electronically, and available for iPads and Kindles. The magazine will be available through Amazon and will showcase color prints of students’ artwork, photography, creative nonfiction, fiction, micro fiction and poetry. “At this time we don’t have any restrictions on what we will accept. That meaning, we do not want our magazine to fall into a certain genre, because we wouldn’t ever want to exclude anyone,” she said. For the first issue, the editing staff has heavily recruited the work of the students in Writer’s Workshop. Without the support of the students the magazine was created for, she said, it will never succeed. The goal of the editors is to open up the magazine more and more with each issue. She said they would love to see a science-oriented issue in the future, followed by a school of education issue, a school of music issue and perhaps a school of social work issue. She said she would like to see pieces submitted from students involved in sports, Greek life and research projects, not to mention the students who work full time with families. The possibilities available excite her. For more information, visit 13th Floor Magazine at http://www.13thfloormagazine.com or like them on Facebook! The deadline to submit for the first issue is April 14, 2013. ← Day 9: 5 days left!